The fictional Texas ranger has become one of the biggest and longest-running American icon, since his first conception on radio in 1933. The fictional masked former Texas Ranger who fought outlaws in the American Old West with his native American friend, Tonto. The most recent appearance of the Lone Ranger was in the 2013 Disney film The Lone Ranger. The character was originally believed to be inspired by Texas Ranger Captain John R. Hughes, to whom the book The Lone Star Ranger by Zane Grey was dedicated in 1915. The radio series proved to be a hit and spawned a series of books, an equally popular television show that ran from 1949 to 1957, comic books, and several movies. The title character was played on the radio show by George Seaton, Earle Graser, and Brace Beemer. Clayton Moore acted the Lone Ranger on television, although during a contract dispute, Moore was replaced temporarily by John Hart, who wore a different style of mask. On the radio, Tonto was played by, among others, John Todd and Roland Parker; and in the television series, by Jay Silverheels. I found the Lone Ranger mini commemorative lunch box at a local garage sale for 25 cents. I included a quarter in the picture to also give an idea of how small the lunch box is. While there is a huge market of lunch box collectors, mini lunch boxes are generally much less valuable, making this piece worth in the realm of $15. 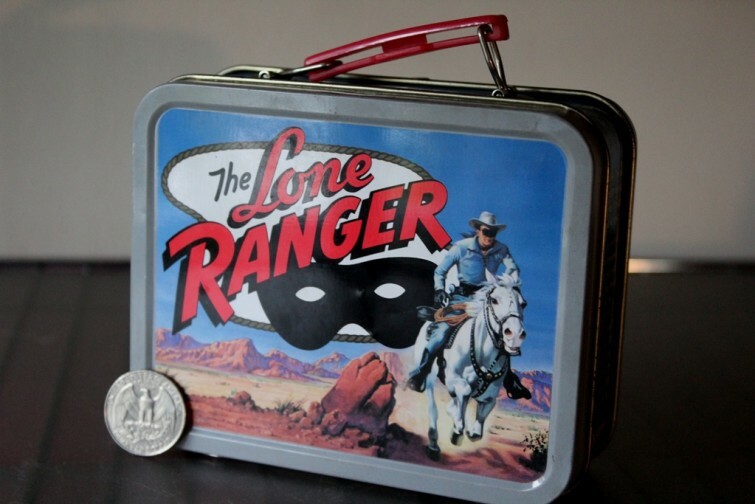 Still, other Lone Ranger lunch boxes have been valued much higher. In 1941, Cheerios was introduced as America’s 1st ready-to-eat oat cereal. In our early years, we developed a strong relationship with a true American hero: The Lone Ranger. In 2001, Cheerios is proud to celebrate our 60th anniversary and our partnership with the Lone Ranger with this commemorative tin. The front of the lunch box shows the Lone Ranger riding on his horse (Silver) with the icon’s logo. The back of the lunch box depicts the Lone Ranger on his horse pointing into the distance next to his partner Native American Tonto.